Our hotel is only a few miles from many exciting attractions, including Duke University and Brightleaf Square with its cool shops and restaurants. Welcome to our newly renovated Quality Inn & Suites, a casual, contemporary hotel in Durham, North Carolina. 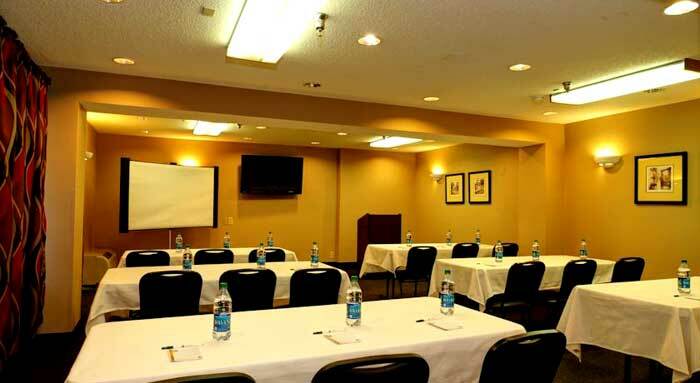 Experience a warm, inviting Durham hotel where you feel comfortable, productive and right at home. Located in a prime location in Durham, NC, our hotel is ideal for business travelers and family vacationers with well-appointed guest rooms and suites and modern lifestyle amenities for everything you do in Durham. Budget-friendly specials and packages allow us to thank you for being our guest. Prime Location Near Attractions - Our hotel is only a few miles from many exciting attractions, including Duke University and Brightleaf Square with its cool shops and restaurants. Explore historic sites like Bennett Place and the city's captivating culture at the new Durham Performing Arts Center (DPAC). Accommodations - Our contemporary accommodations all feature comforts, such as cable/satellite TV with premium channels, refrigerator, desk, sofa, and complimentary high-speed Internet. Our suites offer extra space for dining, lounging and entertaining. Lifestyle Hotel - Surrounded by the energy of Durham, our hotel is the perfect place for doing business and enjoying a relaxed family vacation. Enjoy modern lifestyle amenities, including an outdoor pool, fitness center, laundry, activity desk and complimentary high-speed Internet access. Stay connected to work or print your boarding pass in our business center. Our professional, friendly staff is here to make your stay memorable and enjoyable. Whether you're visiting for business or pleasure, the Quality Inn & Suites offers comfortable lifestyle lodging in Durham, North Carolina. Our casual, contemporary hotel offers comfortable and affordable lodging in Durham with everything you need to do your thing. Start your days with our complimentary continental extended breakfast, get energized in our fitness center, and enjoy thoughtful travel amenities, including laundry facilities, complimentary shuttle service, activity desk and complimentary high-speed Internet access. Activities : In addition to all its spectator sport, the Bull City also offers ten golf courses, numerous hiking, bikin, and walking trails, and water activities at a variety of locations. Whether you want to check out the champions from the stands or get in the game yourself, sports and recreation opportunities abound in Durham. Airport : Raleigh–Durham International Airport 2400 John Brantley Blvd, Morrisville, NC (919) 840-2123 Raleigh–Durham International Airport is the main airport serving Raleigh, Durham and the surrounding Research Triangle region of North Carolina. It is located 4.5 miles northeast of the town of Morrisville in Wake County. Attractions : More than nine million people visit Durham each year, where they will all find a wealth of things to see and do. Whether you're looking for awarding-winning performing arts , unique visual arts , stimulating nightlife , one-of-a-kind shopping , or scenic natural experiences , Durham has you covered! Business : Durham Convention Center 301 West Morgan St, Durham, NC 27701 (919) 956-9404 Welcome to The Durham Convention Center! Spectra by Comcast Spectacor manages the Durham Convention Center, a 33,000 square foot multi-purpose facility located in the heart of downtown Durham. Spectra is an expert in hosting multi-purpose events, partnering with over 300 clients at 400 global properties to create memorable experiences for millions of visitors every year. Dining : Thanks to a thriving colony of imaginative chefs and celebrated restaurants, Durham is known as the Tastiest Town in the South . Praised by noted critics at outlets like Bon Appétit , Gourmet , and The New York Times , Durham has garnered a long list of fans that have fallen in love with its imaginative culinary offerings. Golf : A Place to Play a Round. Fore! Well, actually ten, but let's not be picky. Durham is home to ten golf courses, each with a different style of play to suit championship golfers and weekend warriors alike. 919-286-0411 | 888-878-6890 FREE Directions. Shopping : Discover Durham's unique shopping opportunities, from the Downtown District including Brightleaf to the Ninth Street District , where funky merchandise and unexpected treasures abound. But the galleries, antique shops, and specialty gift stores aren't limited to those areas – you can find dozens of distinctive shops and boutiques sprinkled in neighborhoods and shopping centers throughout Durham. Sports : Duke Blue Devils The Duke Blue Devils men's basketball team is the college basketball program representing Duke University. The team is fourth all-time in wins of any NCAA men's basketball program, and is coached by Mike Krzyzewski. University : Duke University Durham, NC 27708 (919) 684 - 8111 Younger than most other prestigious U.S. research universities, Duke University consistently ranks among the very best. Duke's graduate and professional schools — in business, divinity, engineering, the environ - ment, law, medicine, nursing and public policy — are among the leaders in their fields.